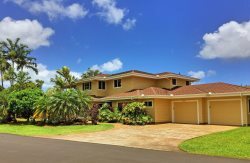 The site is operated by Kauai Pacific Real Estate, LLC. At various times you may give your personal data to us. For example, in order to process a request or inquiry from you, we may need to know all or some of the following: your full name, address, telephone number, e-mail address, your current location, and a method of payment. You may also give personal data to us at other times, such as when registering on the Site, submitting an inquiry, or providing information on a rental application. If you ask us to connect with other sites (for example if you ask us to connect with your Facebook account) we may get information that way too. We obtain data from you either by you inputting your personal details, by the automatic collection of information about you as you use the Site, when we speak to you, or from third parties. Third party information may include credit information which we use to prevent and detect fraud. • To promote services related to the Site. • Any third party you have asked us to share your personal data with – such as Facebook if you have asked us to connect with your Facebook account. If you have asked us to share data with third party sites, however (such as Facebook) their servers may not be secure. Credit card information is stored by our credit card processing partners and we ask them to keep that data secure. We also use third parties to help us optimize our website flow, content and advertising (see below). To maintain good internet security. For example if your email account or Facebook account is compromised this could allow access to your account with us if you have given us those details and/or permitted access through those accounts. If your email account is compromised it could be used to ask us to reset a password and gain access to your account with us. You should keep all of your account details secure. If you think that any of your accounts has been compromised you should change your account credentials with us, and in particular make sure any compromised account does not allow access to your account with us. You should also tell us as soon as you can, so that we can try to help you keep your account secure and if necessary warn anyone else who could be affected. We do not ask for this type of information in an email. Do not provide the information or click on the link. Please contact us if you receive an unsolicited email that appears to be from us or one of our members that requests personal information (such as your credit card, login, or password), or that asks you to verify or confirm your account or other personal information by clicking on a link, that email was likely to have been sent by someone trying to unlawfully obtain your information, sometimes referred to as a "phisher" or "spoofer".